United Nations, New York - The UN Summit on Large Movements of Refugees and Migrants, which took place on Monday (19/09) in New York, created a singular opportunity for the global community to forge a greater consensus on managing the world’s movements of migrants and refugees. This mega-trend of the 21st Century now represents unprecedented human mobility, with one of every seven people worldwide living or working somewhere other than their place of birth. “We are gathered here today for an historic Summit – the first ever to assemble Heads of State from around the world to address the question of refugees and migrants,” said IOM Director General William Lacy Swing in his opening remarks to the Summit at the UN General Assembly. 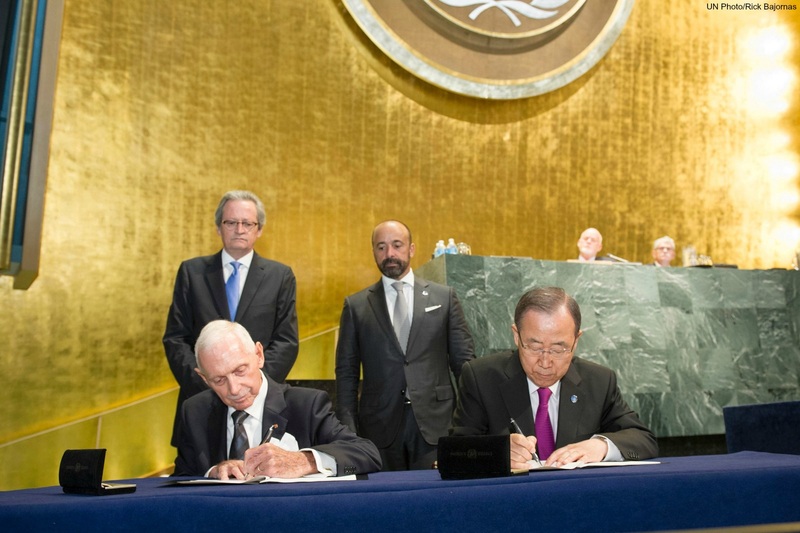 With representatives of nearly two hundred nation states looking on, DG Swing and UN Secretary-General Ban Ki-moon signed a document formally linking IOM to the UN. It established IOM as a “related organization” of the UN, giving the UN for the first time, an explicit migration mandate. The signing signalled the culmination of a process that began in June 2016 when IOM Member States unanimously endorsed the process to join the UN. DG Swing noted that the decision reflected a growing recognition of the importance of migration and the need to better link human mobility with related policy agendas, including in the humanitarian, development, human rights, climate change and peace and security domains. “The signature of this historic agreement brings the leading global migration agency, IOM, into the UN – the culmination of a 65-year relationship. For the very first time in 71 years, the UN now has a ‘UN Migration Agency’. This is a singular honour for our organization – and a genuine success for migrants, Member States and indeed for this Summit,” he said. “A record number of people are uprooted and forced to move – refugees, internally displaced persons, victims of trafficking, unaccompanied minors. Climate change threatens yet a further 75 million living just one meter above sea level,” said Swing. He also noted that the timing of this Summit was critical. “We’re facing a series – that I have not seen in my lifetime – of unprecedented simultaneous, complex and protracted crises and humanitarian emergencies in an arc of instability that stretches from the Western bulge of Africa to the Himalayas,” he observed. “More and more (vulnerable) refugees and migrants are leaving their homes and travelling alone. But the challenge of addressing large movements of refugees and migrants is not insurmountable, if the international community shares responsibility,” he added. IOM’s collaboration with the UN is already close and will become even more so with the organization as part of the UN system. This will help ensure that the challenges associated with the world’s 244 million international migrants are fully addressed by the international community. Most importantly, the Summit’s decision to formulate a Global Compact on Migration by 2018 is a defining moment for human mobility.